QBasic is a variant of the BASIC programming language designed by Microsoft. 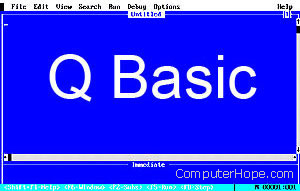 With QBasic the user can design computer programs or utilities. The qbasic command is an external command and is available in the below versions of Microsoft operating systems as qbasic.exe. Starts the MS-DOS QBasic programming environment. /EDITOR Starts the MS-DOS editor. /MBF Converts the built-in functions MKS$, MKD$, CVS, and CVD to MKSMBF$, MKDMBF$, CVSMBF, and CVDMBF, respectively. /RUN Runs the specified QBasic program before displaying it. [[drive:][path]filename] - Specifies the program file to load or run. Open QBasic and run game.bas. Note: If you do not have a program called game.bas, it will open a blank QBasic window. QBasic is not installed when installing Windows 95 and Windows 98. However, QBasic is still on the Windows CD for support with older programs, as well as people still interested in programming in basic. QBasic can be found in one of the below locations. Windows 95 - QBasic can be located in different locations depending on the version of Windows 95 you have, as well as if your CD is an OEM CD. To locate QBasic, place your Windows 95 CD in the computer click Start, Find, and search for qbasic*. *, and ensure that you're looking in the CD-ROM drive. This command should locate two files: qbasic.exe and qbasic.hlp, copy these two files to a directory of your choice on the hard drive. X being the letter of your CD-ROM drive, if you want to use QBasic without the Windows 98 CD you must copy QBasic.exe and QBasic.hlp to a directory on your hard drive. Extra Note: if you have an OEM restore CD and do not have the above directory, follow the instructions for Windows 95 users. Where can I find or download QBasic? See our programming language definition for further information and related links on this term.